The art of donning tilaks on the forehead is an ancient one and dates back to the time of the Vedic Aryans. 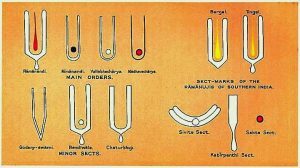 Over time this custom became a ritual amongst Hindus and grew in dimension and diversity as each Shiva and Vaishnava sect developed their own special tilaks. This practice continued down the ages and the tilak remained the customary symbol of all Hindus, irrespective of caste, creed and colour. In the Rigvedic age, a tilak was applied when a yagna or homa ceremony was initiated. At the end of the homa ceremony, the Vedic men put marks on their forehead, the lower end of the neck, on the arms and on the chest. This mark was made with ashes and ghee mixed together on the sacrificial ladle and applied on the body with the index finger. The famous Brahma Purana records that without the mark of the tilak, gifts of cows, offering to the fire, the recital of holy texts were all worthless! The Brahma Purana further records that “a vertical mark was to be made with mud and three horizontal marks with ashes, but a Dwija, Brahmin or twice-born, might mark his tilak with sandal paste.” The Brahma Purana additionally explains that different fingers of the hand were used to mark the tilaks and the meaning of their application is also elucidated. It records that the thumb was used to ensure sound health, the middle finger for longevity, the ring finger for wealth and finally the index finger was used to achieve emancipation. From the Vedic texts it is gathered that there were four different kinds of tilaks for the four varnas, or castes. The marking of two vertical lines on the forehead which in recent times has become a U shape is called Urdhapundra, and is only applied by Brahmins. The tilak for Kshatriyas, the Tripundra, has three arc-like wide upward marks on the forehead above which a circular spot is drawn. The Vaishya tilak is known as the Ardhachandra or half moon and a bindi or circular mark is drawn at its mid point. Finally, there is the portal; the tilak of Sudras, which is a large circular mark on the forehead. The noted 19th century researcher, L.S.S. O’Malley, in his study has observed that “despite the fact that the Urdhapundra was intended for Brahmins, the Vaishnava generally wore this mark in varied forms while the Shaiva prefers the Tripundra which was originally meant for Kshatriyas.” His observation proved to be correct and the modern practice of marking a tilak supplements this fact. In recent times it can be observed that the Vaishnavites are more particular in the wearing of tilaks than the Shaivites. 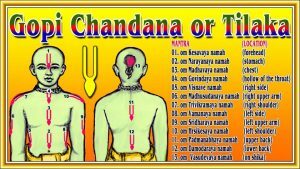 A devout Vaishnavite marks all the twelve parts of the body with tilaks. In addition to the vertical marks, figures of the conch shell, sankha; wheel or chakra, club, gada, and lotus, padma, all attributes that Vishnu holds in his four hands, are drawn on the various parts of the body. The many names of Radha and Krishna are also stamped on the body. The four emblems and names of gods and goddesses are carved on wooden stamps with which they are marked on the body. 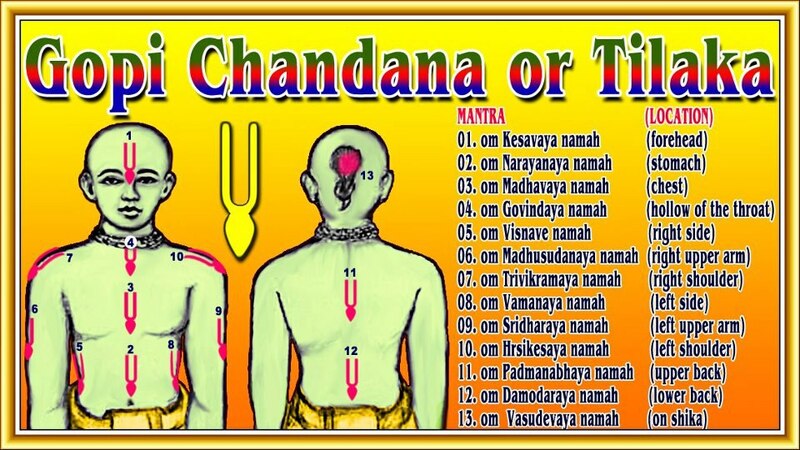 it is commonly believed that every part of the body represents a particular form of god and thus every tilak is applied with the devotion a particular god commands. The most visually prominent tilak is on the forehead. This again differs from sect to sect even among the vast Vaishnavite following. This Vaishnavite forehead tilak is called the harimandira. According to the Haribhaktibilasa, the Vaishnava authority composed in 1562 AD, “harimandira is really the abode of god, for the open space represents Vishnu and the two side lines represent Brahma and Shiva.” The trinity is thus worshipped. The Purana accepts Brahma as the creator, Vishnu or Narayana is the god who maintains the created ones while Shiva destroys and paves the way for creation. This is the importance of the forehead. There are vast numbers of Vaishnavite sects scattered all over India. The harimandira tilak is as varied in number as in range and differs from family to family and region to region. The tilaks worn on the forehead vary in color as well and are mainly made from sindur, vermilion, pitta varna, yellow and Krishna Mrittika, blackish soil color. But the main shade is sandal paste which is creamish with a white tone. Turmeric and lemon are used to extract the pitta or yellow colour while for sindur, lemon is mixed with a higher percentage of vermilion to give it its bright hue. Krishna Mrittika is obtained from the ash of scented dhoops, incense sticks and mixed with lemon. The Vaishnavite chapter of Bengal was unfolded by the great Indian mystic, Mahaprabhu Sri Chaitanya, in the 15th century AD. Thus the path of bhakti was paved for emancipation of the soul. After this many schools of Vaishnavites came up in Bengal. 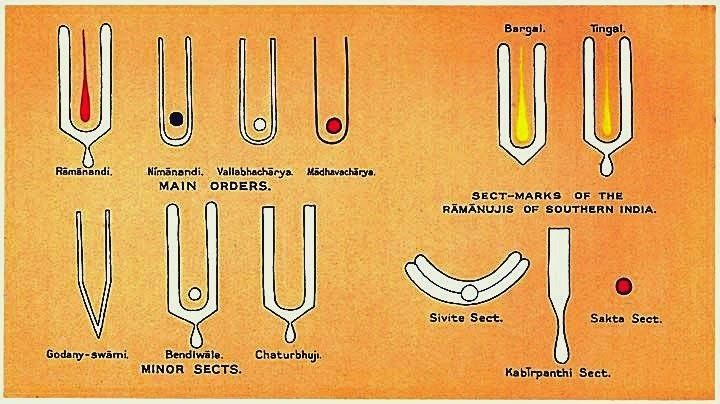 In Bengal, the Vaishnavites wear different kinds of tilaks which range in number from forty to fifty separate varieties. However, there are six most commonly worn tilaks which comprise mainly of twin perpendicular lines which are parallel and marked on-the forehead at the centre of the nose, so that a downward triangle is formed which differs in size. This kind of tilak is worn by the followers of Nityananda Prabhu, Adyaita Prabhu, Acharya Prabhu and Gadadhar Prabhu. They also draw two lines on the forehead but the base is ornamented with motifs of leaves of the banaspatra or bamboo, batapatra or banyan tree and tilapushpa or til flowers. In other parts of India, the Vaishnavite tilaks follow their own traditional fashion. Ramanuja Vaishnavas are more common in the Deccan plateau than in the north. The founder of this sect, Acharya Ramanuja, was born in Parembar (sic) and studied in Kanchipuram. On the banks of the Kaveri River at Shree Ranga he propounded his philosophy. He then travelled around the country meeting other learned men, indulging in spiritual discourse where he defeated many pundits. The most famous occasion was in Venkatgiri where he initiated a Vaishnava puja in a Siva temple after he had won a particularly long scholastic discussion with the pundits there. He set up many moths or temples where the Ramanuja sects flourish till today. The followers of Ramanuja worship Vishnu and Lakshmi in their singular and twin forms. They also worship Rama and Sita. Tilaks form a prominent part of the religious ritual. They apply gopichandan or sandal paste on the twelve parts of their body. They draw two lines with sandal paste from the tip of nose to the end of the forehead, at the juncture of the hair. Between these two lines, they draw another in yellow or vermilion, in the middle of the forehead. This line is called Shree. In Bihar the Ramanuja sect is widespread but their tilaks have a different design. A peculiar tilak, the bargain, is worn by the Bhumihar Brahmins of Tirhut. A Bakra-rekhaot zigzag line is drawn at the middle of the eyebrows from which two straight lines move upwards across the forehead. The base is joined and the tilak looks like a flower held upside down. The shree or middle line is drawn in the centre and also joins at the base. The Ramanandi sect dominates northern India. They are worshippers of Rama, Sita, Lakshman and Hanuman. Hearsay has it that Ramanandi was disillusioned with the Ramanuja sect and his guru, Raghabandra. He left them and settled on the banks of the Ganga at Varanasi. His disciples were from all castes and creeds and some of his principal followers included Kabir, a weaver, Boydas, a leather worker and Sen, a barber. As with other Vaishnavite sects they also worship the Tulsi and Salagramshila which are accepted as embodiments of Narayana. The Ramanandi sect tilak is a semi-circular arc painted with sandal paste in the middle of the eyebrows. Two vertical lines of sandal paste which are ultimately based on two perpendicular lines end at the middle of the eyebrows where the semi-circular line is drawn. This is called sinhasan. The singular line centering the nose is drawn with sindur and is known as agya chakra. Another Vaishnava sect is called Achari. The word Achari originates from acharya which is the name given to the chief gurus. The Acharis are worshippers of the conch, chakra, gada and lotus, the emblems Vishnu holds in his hands. Only Brahmins are permitted to join the Achari sect. The Acharis are mainly from the Deccan and are descendants of families who were followers of Ramanuja’s philosophy. Like the Ramanandis, the Acharis draw two upward lines on the forehead. Unlike the Ramanandi tilak, these are not vertical lines but parallel and the shree is drawn with the yellow of pitta varna. One of the main sects is the Ballabhachari which is predominant in north-western India. They are worshippers of Radha and Krishna, and the child Krishna, Bal Krishna, has recently become very popular. In some respects the Ballabhacharis are considered modern Vaishnavites as Ballabhacharya preached the abolition of stringent practices of self-torture like starving and so on. They have a fairly materialistic outlook and believe in a family life. There are clear instructions that all disciples should offer mana; mind, tana, body and dhana, wealth to their gurus who are called Goswamis. On the forehead they draw two parallel lines with sandal paste, while between the eyebrows at the top of the nose, the mark is shaped like a half moon. Between the two lines they draw a circular tilak with vermilion. Like other Vaishnavites they draw the conch shell, chakra; gada and lotus on their shoulders and chest. Madhvacharya, the founder of the Madhvachari sect, hailed from a place called Ananta Pari Tulab in South India. He was born in 1121 AD and began his intellectual life in Ananteshwar Vidyapith at the age of nine. He studied the Vedas under his Guru Vyas-Deva in Badrikedar. Vyas-Deva finally gave him three salagram shilas which he later placed in the three mathas founded by him where he erected statues of Vishnu. Udipi is their main centre of pilgrimage. Only a sanyasi or Brahmin could become a disciple by performing dikshas or penance. The Madhvacharis use hot iron blocks to emboss their bodies, especially the shoulders, with the four symbols of Vishnu. They draw tilaks on the forehead with two lines of sandal paste which begin at the tip of the nose and move upward to the roots of the hair. Between these two lines they draw a black line with the ashes of dhoop or incense sticks offered to Vishnu. This shyam mark ends at a circular mark of yellow at the middle of the eyebrows. In Gujarat sects like the Atibari, Bindu-dhari Vaishnavites sprang up while in northern India, Harioyashi, Ramprasadi, Varagal were the main Vaishnavites. All these sects were formed and named after their gurus. The Harivyashis unlike Ramanandi draw only a singular semi-circular line instead of the round circular spot at the middle of the eyebrows. From this semi-circular line they draw two vertical lines with sandal paste. On the other hand the Ramprasadis mark vertical lines in the middle of which they draw a gopichandan spot of a bigger size. This is known as the Beni-tilak and legend has it that Sita drew this tilak on the forehead of Ramprasadi with her own hand. The centre of the Varagal Vaishnavite sect is in Surur village in the Gorakhpur district. They are believers of the Sanskrit shastras and worship Vishnu shakti. They are also found in south India. Like other Vaishnavas they draw tilaks of vertical lines on their forehead but they do not make the circular line in the middle of the eyebrows. They draw the shree in various colours in the middle of the forehead centring the nose. The Ayodhya-based Laskari Vaishnavas draw a tilak simi- lar to the Ramanandis. The only difference lies in the shree which is white rather than red or yellow. The Chattarbhuj Vaishnavas draw similar vertical lines which end on a circular line, but their tilak does not have a shree and the space in between remains empty. The tilak symbolises not only a sect, it is also a way of life. It is an integral element of Hinduism and applied with reverence it becomes an act of worship.